i think flowers deserve their own post. i love having fresh flowers in the house, and there is no better reason to buy some then for the holidays. i bought two bouquets from the grocery store and used gourds and apples. i used a vintage teacup that i have to make this little one, which was my favorite. first you arrange the flowers in your hand into a little rounded bouquet. i used alstroemeria, carnations and mums. then wrap a rubber band around the base. cut off bottom and place in tea cup. i used the alstroemeria leaves to maket this one. unfortunately i forgot to put water in it so it died by morning! but the fruit and pumpkin was still intact. i used a vintage milk glass bowl. i think it probably cost about a buck or two from a flea market. and you may remember this one from october. and i made these two little ones for the bathrooms. i hope that everyone had a wonderful thanksgiving. ours was great, we had both sides of our families over for thanksgiving day, and even the day after. thanksgiving has to be our favorite holiday, mainly because the focus is on food and thanks. i love getting out my china to use, and seeing what serving dishes i can use. i LOVE the amber glasses i have. i bought 6 of them at a flea market, then found 6 more on ebay to make a set of 12.
i picked this flower dish at a flea market this summer. it's the first time i got to use it! it's so adorable. i have a couple throw pillows i made in my etsy shop. this one was made with vintage fabric (actually sheets) that my mom found in my grandpa's closet. this fabric is to die for. she knew how much i'd love it and i do! this one, which i will call the jennifer, because i made two for her that she loves, was also made with vintage sheets. why don't they make sheets this beautiful anymore?? and that lovely sewing machine that i bought has a feature where you can sew letters, so i've been adding brandeye to them. cute, right? i think so at least. they each come with EcoInserts, which were made with stuffing from recycled plastic bottles. 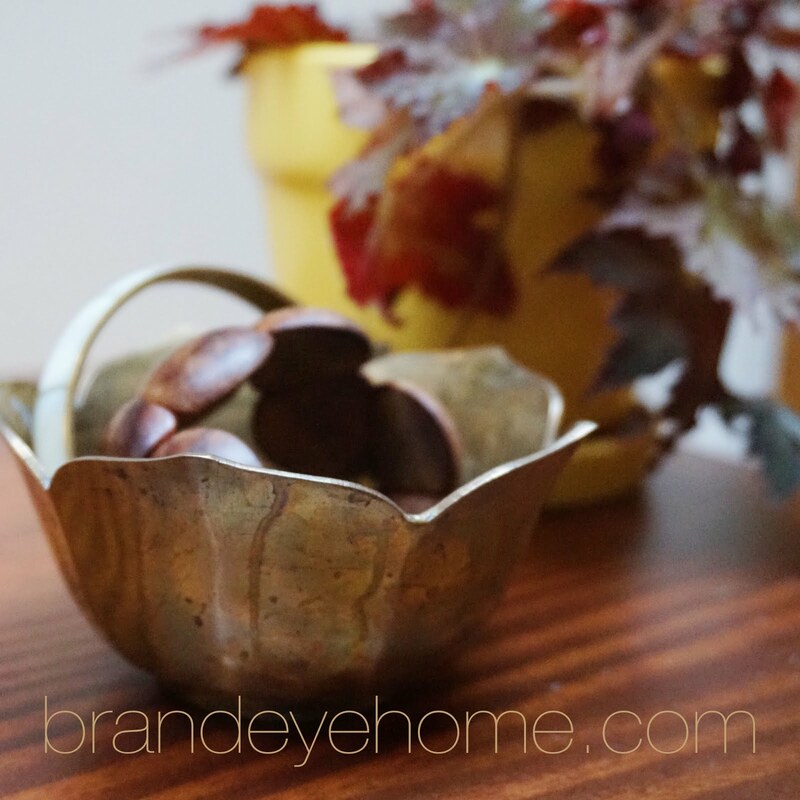 clicking on the pictures will take you to the brandeye etsy listing! this is the first weekend in, i don't know... months? that we haven't had anything to do or go to. but i managed to get a lot done so far, and also relax, which is just as important. last night dave made a delicious dinner, pasta with meatballs and sausage. it was heaven and we had it again for lunch today. and we hung out with these two guys. moz is doing much better today! what are you doing on this lovely, but cold, weekend?? moz had his surgery on wednesday to fix his knee, he tore his crucient ligament (like the ACL on the person). we picked him up yesterday and he was so out of it, i don't even think he knew who we were! but i guess if i was on fentanyl, morphine and tramadol i wouldn't know my parents either. the first night was rough, he cried non-stop so none of really got any sleep. it's so sad to know your pet is in that much pain and you can't do anything about it. i took a 1/2 day today so I could spend most of the day with him. judging by the amount of whining and noises he's making, he seems to be feeling a bit better, so that is great. friday night my friend jenn and i went to art after 5 at the philadelphia museum of art to check out the gee's bend quilt exhibit, and of course drink some fine wine. every friday the art museum has music and food and drinks in the main stairwell area, it is always a lot of fun. since most people are there to check out the music, the galleries are practically empty. the quilt exhibit was really great, it's amazing what these women made with left-over scraps of clothing and things that we would normally throw away. i first took this picture and then got yelled at for taking pictures. aparently in the "special" exhibits no photos are allowed. then i was yelled at again when i was pointing to a quilt and explaining to my friend how they are made. the lady thought i was touching it; i was not touching it! anyway, when we were a little further through the exhibit, i snuck another picture. a lot of the quilts were constructed from courduroy, which i love. i tried to take a picture of us, but it came out blurry. the only one that wasn't blurry was only 1/3 of the top of our heads. this painting is magnificent. it's by thomas eakins. i love the shaker and glass collections. i made some holiday cards and hang tags to add to my etsy shop. i really need to take a photography class because my pictures always come out dark. i was going to take the pictures outside, but it's raining. boohoo. anyway! they are all made with 100% recycled paper and have been machine embroidered. have i mentioned how much i love my new sewing machine? well i do. stop by my etsy shop brand-eye to buy! this morning we took moz to the upenn orthopedic vet to have them check out his leg and the lump on his belly. luckily they think the lump is nothing, just fat! we are super relieved. next up, knee surgery! the poor guy will get it next week, then 8 weeks of recovery. no running, jumping, anything for 2 to 3 months. he will be a sad pup. we got home earlier than we thought we would, but both took the whole day off, so we raked some leaves into piles in the back yard. we have speakers outside, so we also had a bit of a dance party. i'm sure the neighbors were amused, but hopefully they were all at work! i took some pictures of the changing leaves and flowers in the backyard. sorry, no pics of the dance party. i also added some more stuff to my etsy shop brand-eye. the fabric may look familiar! i finally have one handmade item on etsy, and a couple other cool things. i made a pillow using a vintage fabric that is divine. the colors are so rich and beautiful i want to keep it for myself. i also added a couple of vintage plate sets. these sets are really awesome and would make great holiday gifts, or just splurge and buy one for yourself. the sets include vintage plates, plate hangers that are already attached (DISC brand, invisible adhesive hangers), ook (R) picture hangers, newspaper templates and directions for hanging. the only thing you will need is a hammer. the above two are listed in my etsy store brand-eye. two more to come tomorrow! making a cover for a pillow is quite easy. i made a set of lovely pillows for a friend yesterday, for her surprise housewarming party. as luck would have it they matched the living room perfectly! the pattern is a little springy, but that burst of spring will be welcome come february when everyone is sick of the cold, dark winter. so here are the instructions. this is my first attempt at giving sewing instructions, so hopefully it makes sense at least a little bit. 1) cut the fabric so that it wraps around the pillow with about a 6" overlap. trim the sides so that you have about 2" extra on each side. for example, if your pillow is 12" x 12", the fabric will be approximately 30" x 16"
2) iron fabric. in order to sew both short ends, fold over about 1/2 " and iron, then fold over again 1/2" and iron. 4) place fabric on surface good side up and place pillow on top. center pillow between the short sides and fold up the long end that you want to show on the outside. then fold down the top. 5) with a pin, secure one side together, making sure you have all 3 layers and it fits snugly. then secure the other side in the same fashion. 7) lay fabric and adjust, if needed, to ensure no puckering of fabric, it should lay flat. where pin is make a line with the fabric pencil from top to bottom, going through the center of the pin. repeat on other side. 8) use sewing machine or hand sew along lines that were just made. 9) turn right side out and insert pillow. i feel like america finally made an intelligent decision. way to go usa.